Mutations in SORL1, which encodes the intracellular sorting receptor SORLA, are a well-known risk for Alzheimer disease. Recent GWAS have also identified SORL1 variants that are associated with obesity in humans and other metabolic traits; however, it is not clear how these mutations impact metabolic regulation. Vanessa Schmidt and colleagues at the Max-Delbrueck-Center for Molecular Medicine developed murine models to evaluate the effects of SORLA deficiency and overexpression on fat metabolism. Compared to control animals, SORLA-deficient mice showed an inherent defect in fat mass accumulation that resulted in reduced weight gain even when fed a high fat diet (HFD). Conversely, overexpression of SORLA specifically in adipocytes resulted in enhanced fat mass accumulation and an exacerbation of HFD-induced weight gain. Furthermore, SORLA-overexpressing mice had excessive accumulation of lipids in muscle and liver, supporting a role of SORLA in mediating obesity. Studies in adipose tissue explants revealed that loss of SORLA enhanced lipolysis, while overexpression of SORLA reduced lipolysis. SORLA inhibited lipolytic activity by increasing surface expression of the insulin receptor, thereby enhancing insulin signaling in target cells. Evaluation visceral adipose tissue of obese human subjects revealed a positive correlation between BMI and both SORL1 expression and SORLA protein levels. Collectively, these findings demonstrate that SORLA is an important facilitator of insulin-mediated inhibition of lipolysis and provide insight into the relationship between obesity and SORLA dysfunction. The accompanying image shows control CHO cells (top row) and SORLA-expressing CHO cells (bottom row) prior to (left column) and 30 minutes after insulin exposure (right column). 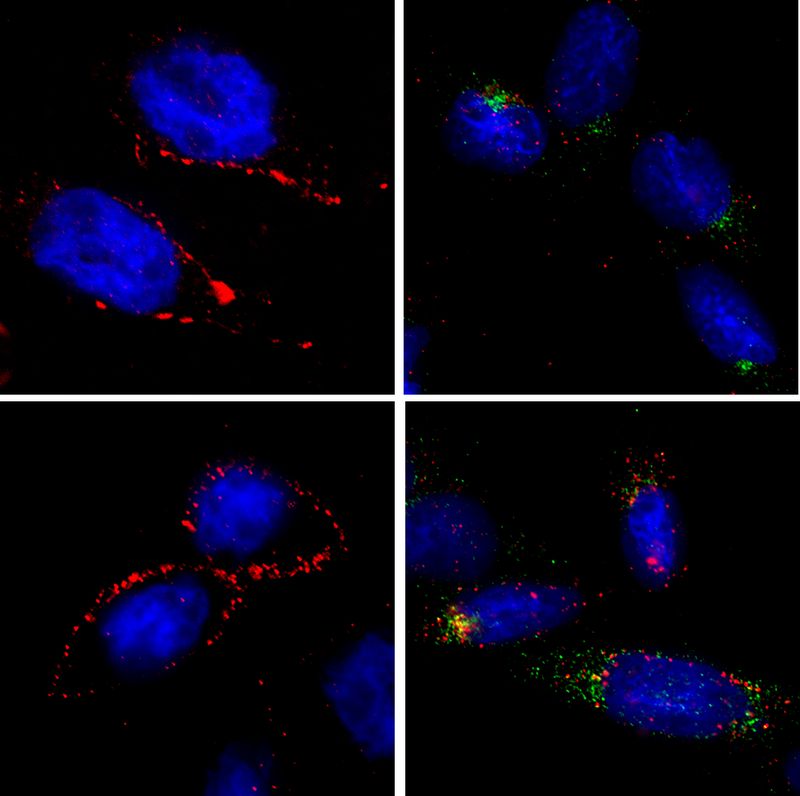 Prior to insulin administration, both control and SORLA-expressing CHO cells have similar levels of the insulin receptor (red) on the cell surface. Upon insulin exposure, the insulin receptor is internalized in both cells; however, the receptor is degraded in control cells but accumulates within recycling endosomes (RAB11, green) in SORLA-expressing cells and recylcled back to the membrane. Citation Information: J Clin Invest. 2016;126(7):2706-2720. https://doi.org/10.1172/JCI84708. In humans, genetic variation of sortilin-related receptor, L(DLR class) A repeats containing (SORL1), which encodes the intracellular sorting receptor SORLA, is a major genetic risk factor for familial and sporadic forms of Alzheimer’s disease. Recent GWAS analysis has also associated SORL1 with obesity in humans and in mouse models, suggesting that this receptor may play a role in regulating metabolism. Here, using mouse models with genetic loss or tissue-specific overexpression of SORLA as well as data from obese human subjects, we observed a gene-dosage effect that links SORLA expression to obesity and glucose tolerance. Overexpression of human SORLA in murine adipose tissue blocked hydrolysis of triacylglycerides and caused excessive adiposity. In contrast, Sorl1 gene inactivation in mice accelerated breakdown of triacylglycerides in adipocytes and protected animals from diet-induced obesity. We then identified the underlying molecular mechanism whereby SORLA promotes insulin-induced suppression of lipolysis in adipocytes. Specifically, we determined that SORLA acts as a sorting factor for the insulin receptor (IR) that redirects internalized receptor molecules from endosomes to the plasma membrane, thereby enhancing IR surface expression and strengthening insulin signal reception in target cells. Our findings provide a molecular mechanism for the association of SORL1 with human obesity and confirm a genetic link between neurodegeneration and metabolism that converges on the receptor SORLA.